Remarketing isn’t just a clever way to target customers who left your website without making a purchase, or those who abandoned their carts at the checkout – it’s also a great way to drive even more conversions from valued customers. 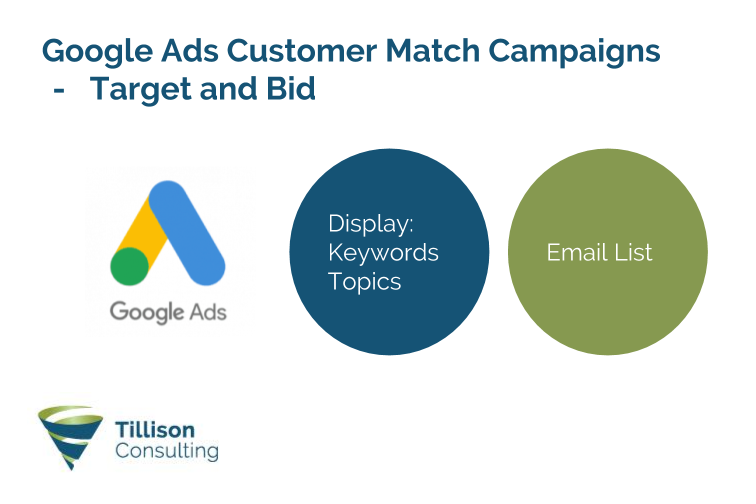 Our latest T-Time show looks at how you can target email lists with Google Ads and how using customer match and other similar audiences can help optimise your Google Ads performance. (01:16) In the Remarketing tab of your Google Ads Audience Manager, click on the big blue ‘+’ in the top left corner to create a new remarketing list. Select the Customer List option, give your audience an appropriate name and select the List members – this is the type of customer data that you’d like to create an audience with, so in this scenario the option you want to select is Upload Emails, Phones and/or Postal Addresses. When you’re creating a Customer Match audience list, we would recommend using this template so that you can upload your data in the correct format. You have the option to upload either unhashed plain text data, or hashed data – the latter adds an additional encryption which essentially protects your data from being seen by Google employees. Google won’t have to use the data to do anything else, so the choice is ultimately yours. Once you have uploaded your data, it will take Google around 24 hours to process it and then match the email addresses in your list to users in Google’s system. The period of time you keep someone in your list depends on the type of campaign you are running – if you’re thinking about uploading lists of customers or people that subscribe to your newsletter and so on, you may want to think about how long it’s been since you last contacted them and consider removing them from the list if it has been a long time. 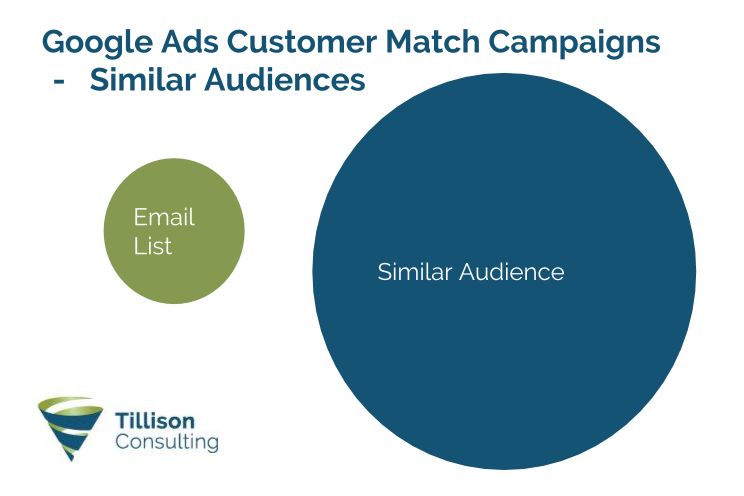 (04:22) When targeting email lists in Google Ads, it’s important to understand the limitations for the sizes of audiences that you can use for different types of campaigns. The first thing to understand is that you must have a minimum list of 1,000 email addresses in the file you upload for Google Ads to accept it. 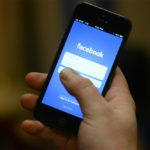 If you don’t have that many email addresses, it’s questionable whether targeting email lists is even worth doing, and you certainly can’t upload just three or four email addresses as this would be a gross invasion of privacy. Next, you need to understand that Google isn’t going to match all 1,000 – or however many you upload – of those email addresses with users of Google. It will match these email addresses with the primary emails of users – this being the email that the user is logged into while using Google. 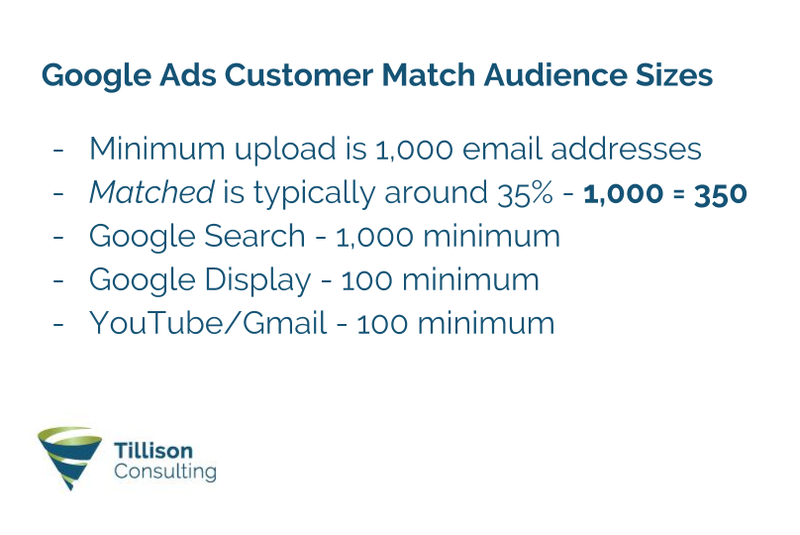 Google is currently matching around 35% of email addresses, so if you want 1,000 people in your audience, then you would ideally need to aiming to upload around three times that figure. If you plan on using your email list on Google Search, then you will need a minimum of 1,000 matched users. If you only have 2,000-2,500 matched email addresses, feel free to upload and test it, but if you’re not eligible to target an email list in Google Search with that amount then you may have to change your parameters, or just wait until you have more email addresses. Google Display will work more in your favour, as you only need a minimum of 100 matched users. This is also the minimum if you wish to run a YouTube or Gmail ads campaign. (07:19) There are two ways you can use an email list for RLSA campaigns: the first, known as ‘Target and Bid’ is with traditional Search and Google Shopping campaigns, where you’ll either be bidding on keywords or uploading your product inventory. 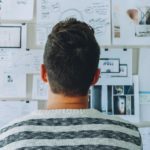 Traditionally you would have a campaign for specific types of keywords, each with their ad groups, or your shopping inventory, and you would target people searching for your products or your keywords. However, with the addition of an email list, you can choose to only show your ads to users who match within the list. One way you can use this method to your advantage is by bidding on some lower-intent keywords – for example, if you run a gift eCommerce store then just bidding on a keyword like ‘gift ideas’ on a normal Search campaign is not going to be very viable because of the low intent. However, if you’re bidding on ‘gift ideas’ and you’ve uploaded your email list to use in an RLSA campaign, then your ad will only be shown to users who already trust your brand and are more likely to make a purchase. (09:10) Your second option when using an email list for an RLSA campaign is adding your list to your normal Search or Shopping campaign as Observation, or what we used to call ‘Bid Only’. You would exactly the same campaign structure as you do now, but what you might want to do is increase the bids for users who match your email list by 30% because we know that these are people who have already bought from you and therefore they’re more likely to convert. 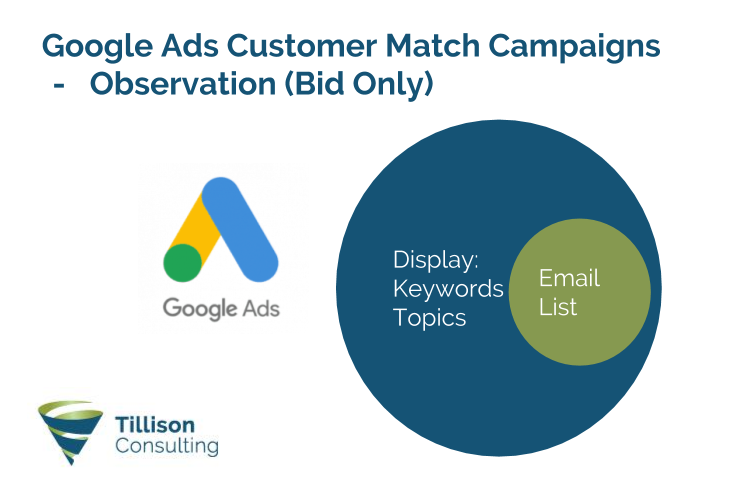 In summary, you’re still targeting everyone who’s going to match your keywords or your products, but as an overlay you’re paying more per click for the users in your email list. (10:08) Using Google Display, you can target content across the web for particular keywords – for example, if you’re selling televisions you may bid on ‘Sony TV’, ‘Samsung TV’ and so on. Google will then match your ads to content which features those keywords. You can also go for a broader approach and target in-market audiences – using the TV example again, these are the kind of people who are in the market for a TV. 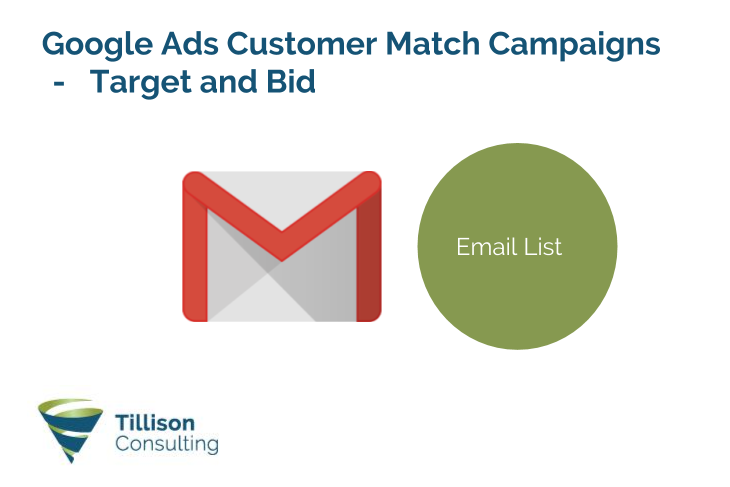 However, much like the Target and Bid model for a Search campaign, you can only target them if they match to an address in your email. 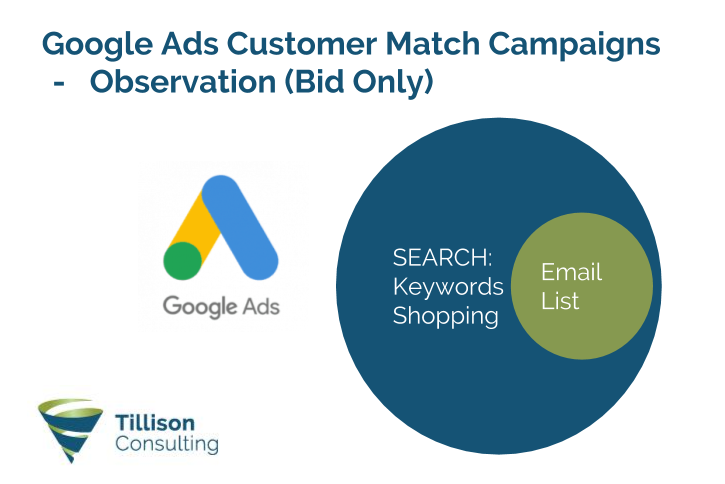 (10:48) Again, in a similar style to the Observation model for Search campaigns, you can target everyone reading content surrounding your topic or subject, with increased bids for users who match within your email list because they’re ideally more valuable. (11:04) If you want to promote your video campaigns, you generally target the content and people watching videos surrounding a particular subject. 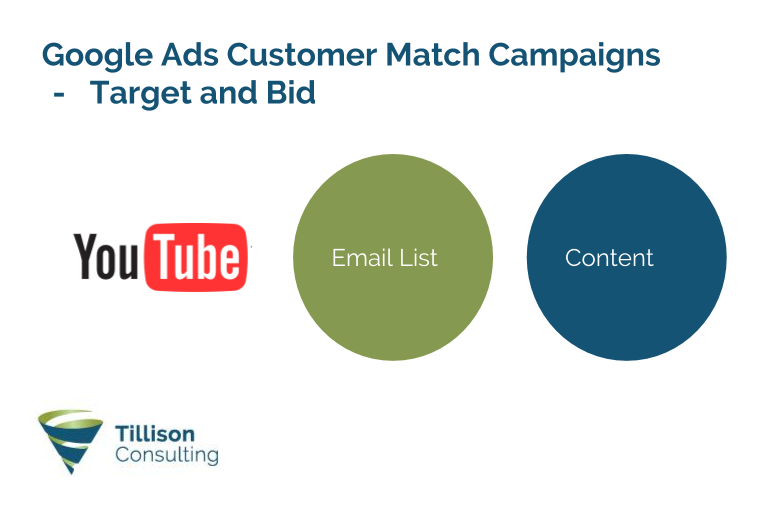 You can use your email list for a YouTube campaign, but only to target users who have matched within your list. This method is particularly useful for nurturing your email list and keeping your brand present, as well as specifically targeting your audience on YouTube with a promotion for your products or services. (11:43) Using Gmail ads does not mean sending emails to addresses in your email list – these are ads that sit next to the emails which users are reading within the Gmail interface, and essentially adopt the same model as YouTube campaigns. (12:04) There is a way of asking Google to target similar audiences to your email list. However, this is a very different strategy to all of the above and as such requires a careful approach: the users who match within your email list and, as previous customers, trust your brand are very different from users who may have never even heard of your brand, so the conversion rates from these ‘similar audiences’ are going to be much lower. That said, targeting similar audiences can be very effective – try setting up a campaign targeting a similar audience with a particular offer to introduce the brand and encourage some more traffic through to the website, before using remarketing to nurture that audience once they convert. (14:08) If you’re using a customer relationship management (CRM) system or concept systems such as MailChimp, Magento or Shopify, you should be able to export the data to segment your email list. This is provided you fulfil the minimum audience size requirements – there’s no point in targeting the 300 highest spenders on your eCommerce store if your audience isn’t big enough to perform any email list targeting. 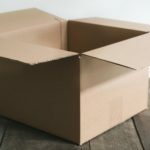 As well as highest spenders, you can target customers who haven’t made a purchase in six months, or perhaps those who only bought a specific product or brand. You can even target users who clicked on an email campaign but didn’t convert in any other way. 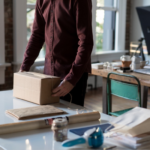 This method could prove particularly helpful in the lead-up to Black Friday and Christmas – if you have data on customers who made a seasonal purchase last year, then why not export it and add the address to your email list to encourage them to do the same again this year? If you found this episode of T-Time useful, subscribe to our YouTube channel for more forthcoming tips and advice on how to improve your business using Google Ads, Google Shopping and other online channels.